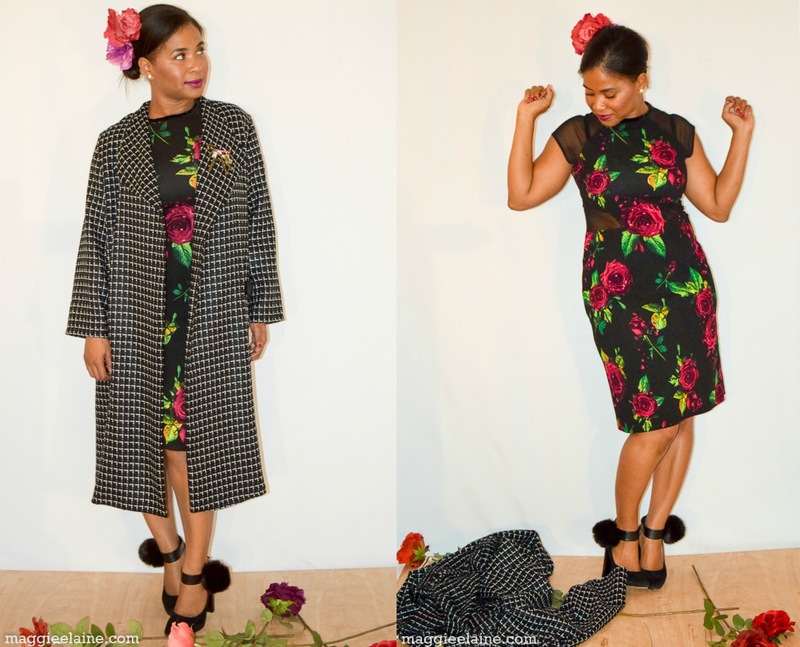 We've made it to the LAST WEEK in the Fabricista Fashion Challenge! I can't believe it's already over! I know all 6 ladies worked really hard and the last three worked especially hard at this week's challenge--- Find Your Inner Designer. Read more about the challenge HERE. Take a look through and vote for your favorite! Remember, everyone is a winner this week, but the grand prize winner gets to be a regular blogger for us! When you're ready to vote, scroll to the bottom of this post and VOTE! We have a great group of judges this week -- 5 of them to be exact! Deepika from PatternReview.com, Angela Wolf from Angela Wolf Designs, and two ladies from the social media team at Nancy's Notions - Emily Jansson and Lindsay Cavens. You can read about all of them HERE. Lastly, if you played along with this challenge, don't forget to use #fabricistafabricmart on Instagram and Facebook when posting your photo! One winner will be chosen at random to win a 2017 Julie's Picks membership! Entries are due by Oct 10th. Each time I open a fashion magazine and see Dolce and Gabbana (D&G) ads, I am always so captivated by the visual imagery, that I find myself staring at every little detail in the 1 to 2 page ads. Just when I think I am ready to turn the page, I find myself always going back to look some more. When I did a little research on the two designers (Domenico Dolce and Stefano Gabbana), I learned that they consider themselves storytellers and use fashion as a way to tell a story. "When we design it's like a movie (Domenico)," says Domenico Dolce. "We think of a story and we design the clothes to go with it (Domenico)." After understanding their approach to fashion, it makes sense to me why I find myself always getting stuck on their ads. Maybe it’s not just the colors, boldness, and the hint of gaudy that I am pretty fond of, but perhaps, I am subconsciously taking in the story they are attempting to tell. This inspires me, because I too like to tell stories when it comes to my sewing projects. I love using things in my projects that have a meaning, whether it is upcycling or using something that belonged to my grandmothers, something special that I came across thrifting/bargain shopping, or a reason why I was inspired to make something. I enjoy sharing my thought process on things that I make or why I choose to do something in a certain manner. I like to tell about my mistakes, triumphs, and the fact that I am a hopeless romantic and student in the art of sewing. I chose to do a look that I think would fit into Dolce & Gabbana’s 2016 Fall Ready-to-Wear runway show. This show was all about fairy tales, color, flowers, houndstooth print, accessories galore, oversized coats, and more! I took a few elements that stood out to me to create my look. I used materials that I either already had or had easy access to obtain. A part of this week’s challenge was to also make a look that would fit into your lifestyle, so my look is a bit more toned down to fit my lifestyle. I created a floral print dress with a somewhat bumpy/bubble textured knit that I found in the LA Garment district a couple months ago. This fabric was very inexpensive ($5 or less a yard), but against my better judgement I only picked up 2 yards of this (wish I had more). However, it was enough for me to make Burda 6858, View C. For the upper and lower yokes, I used a stretch mesh from my stash. I trimmed the neckline in velvet, by making double-folded bias tape with a bias tape maker. I topstitched around the yokes, which was necessary for ensuring the seams didn’t pop-up underneath the sheer mesh. 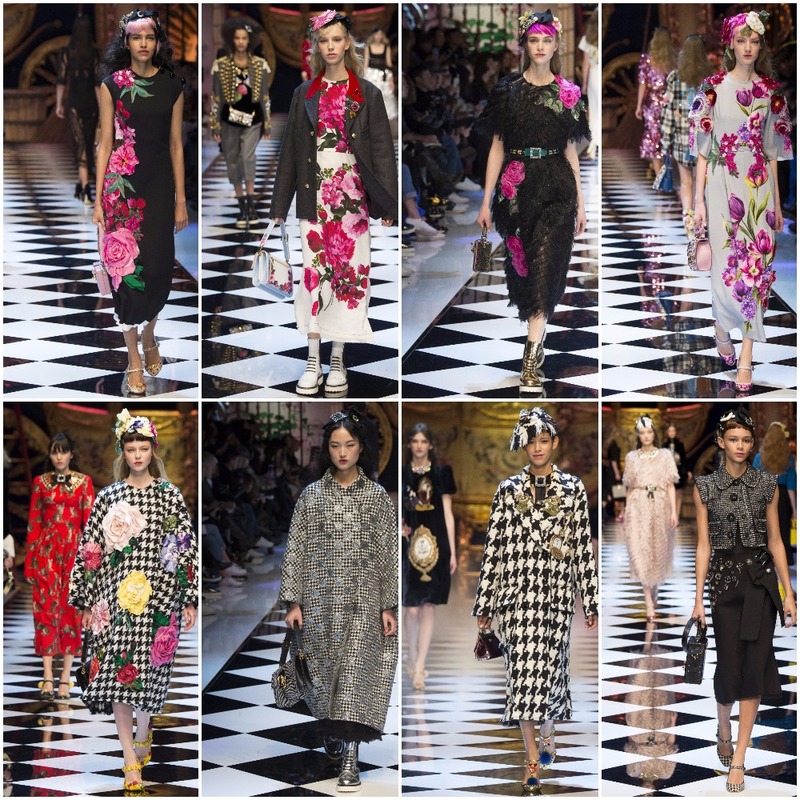 Florals/flowers, mesh/sheer, and velvet fabrics were all used here and there in different D&G looks. I will get a lot of wear out of this dress. 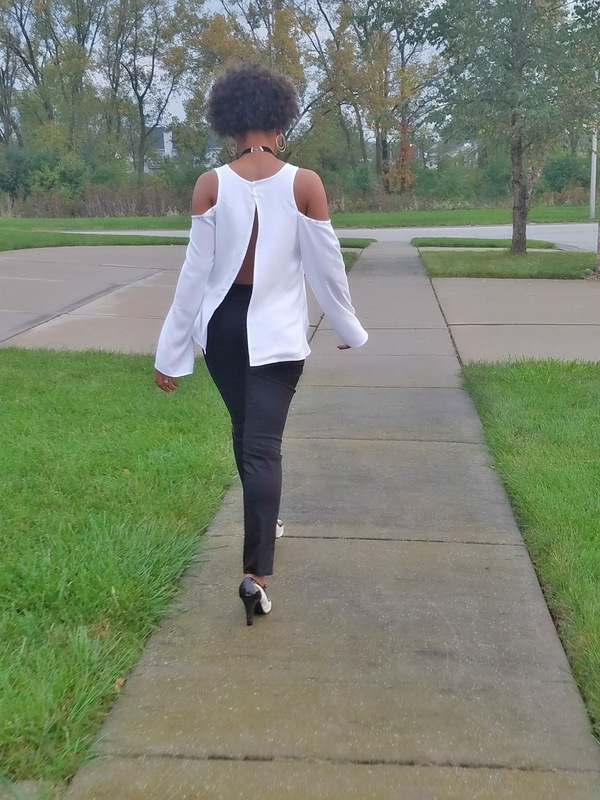 I didn’t make it too fitted or tight, because I want it to feel comfortable enough to wear to work/church with a blazer or function without additional covering or shapewear. 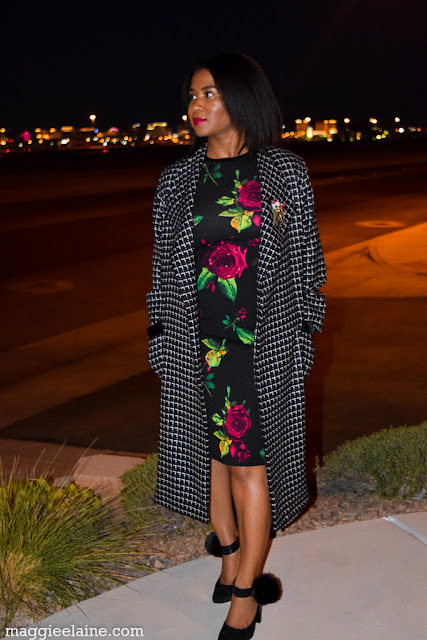 The winter in Vegas does not get terribly cold; however, a jacket or light coat is necessary in December and January. I don’t wear my wool coats often, because they are lined and a bit heavy. So, I have been in need of a lighter wool outerwear piece for quite some time. Also, I am really into oversized coats. I think it is important to get the oversized coat size right to pull the look off. The ones I have tried tend to swallow me, so making my own was ideal. 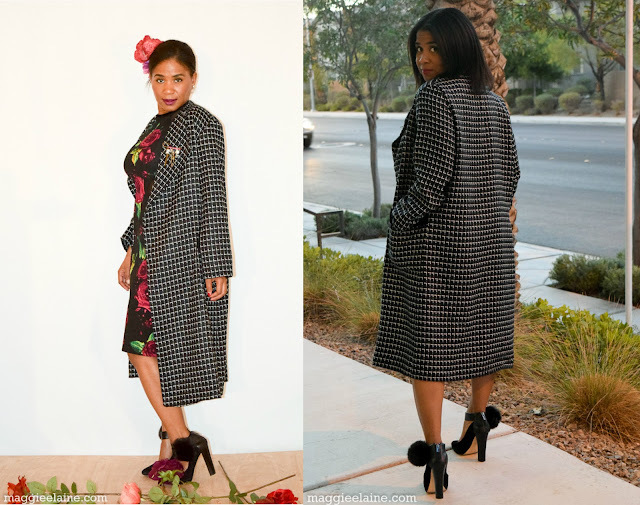 When I saw the oversized houndstooth coats in the 2016 D&G collection, I thought it would be a great time to go ahead and make one. I made this unlined coat using Burda 6736 View A, and I cut the smallest size. I had this lightweight tweed fabric in my stash for a while. It does not exactly look like houndstooth print, but it was labeled that way on the bolt. What is so perfect about this fabric is, the texture on the wrong side is so soft and not itchy; therefore, great for my unlined lightweight wool winter coat. I have no intentions on adding closures to this coat, because I want it to have an open look. However, if I decide to close the coat, I am able to overlap it and tie it with a belt. To add a bit of contrast to break-up the print, I added velvet to the upper portion of the pockets. This fabric frays as soon as it is cut, so I serged my edges after I cut each piece. As aforementioned, D&G used a ton of accessories with their looks in the form of kilt pins, beading, fabric flowers, frogs, brooches, furry pom-poms, etc. I added an element that I feel tells a bit of my story. I attached a charmed kilt pin and replaced a few of the charms to reflect my interests in sewing and fashion. It may be hard to tell from the picture but the charms include, a dress form, scissors, spool of thread, ruler, flowers, and Eiffel tower (dreams of going to Paris Fashion Week). Lastly, to complete the look, I attached little furry balls to my shoes that I took off a couple of key chains, by wrapping the small elastic cord on the balls to a metal label on my shoes. Hope you enjoyed my D&G inspired look! Thanks for reading! The search for my inner designer took me to the Fall 2016 runway shows of Balmain and Miu Miu. I've always loved Balmain's denim, but I was drawn to this show because of the color. As a person who looks best in lighter colors, I love the light airy hues of this show. 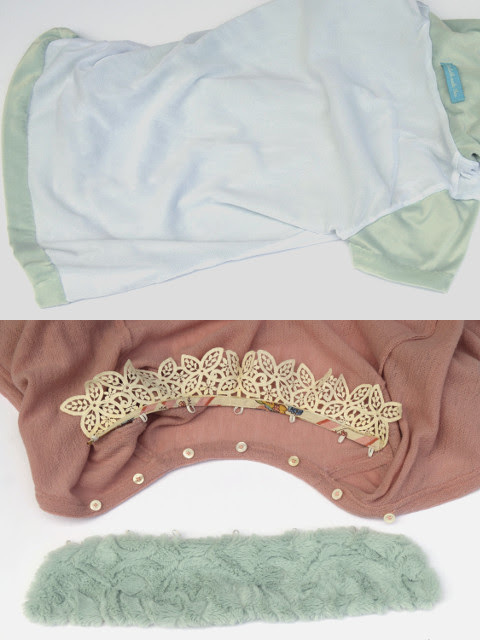 I've never understood why it is that pastel shades are reserved for Spring and Summer in the fashion world. Yay for Balmain and others for challenging that. This season, a lot of designers used a lot of highly textured fabrics in their collections. Miu Miu was my favorite. There are velvets, wools, faux furs, laces, tapestry all combined into highly layered looks. For me, layering is what fall is about. Our average temperatures can range from snow to the high 70s with everything in between. With so much variance, having clothes that can be easily layered keeps me prepared. My look combines the candy colors of Balmain with the textured fabrics of Miu Miu into this velvet top, wool cardigan, and jacquard jumper dress. For this top, I copied a Banana Republic cashmere blend sweater I've owned for several years. It has cap sleeves, a scoop neckline + a turtleneck that is tied so that one side of the neck drapes. I love the style so much, and really, I've always intended to copy it. I slashed and spread the neckline of my t-shirt pattern's front to get the gathers. The turtleneck is a 21" X 14" rectangle sewn into a tube that's a giant neck binding. The tie piece is 15" X 3" sewn into a tube and tapered at the ends. The velvet for this top came from a nice quality throw blanket I've used for guests. It's stretch velvet on one side and faux fur on the other. Velvet can be really visually heavy due to the fact that it absorbs light. Because of that and because I've only ever seen stretch velvets in the dark jewel tones that don't look the best on me, I've never worked with stretch velvet. But this velvet IS one of my colors! The only problem with sewing with velvet is that you have to sew with velvet. And velvet is quite a demanding lady. When I cut the pieces for my top, the velvet curled up completely...like Shirley Temple curls. Pins are useless with velvet; they leave holes in it and do not help with the creep factor. Because of velvet's pile, when two layers of it are together, they will fight against each other and feed at drastically uneven rates. I once made a set of velvet floor pillows and discovered that it is actually possible to cut 2 rectangles of fabric the same size and end up with one seam 4" longer than the other. To tame the curling and the creep factor, every single seam was hand basted within the seam allowance. I used an extra-fine beading needle so as not to damage the velvet. When hand-basted, the seams sewed up really quite easily. 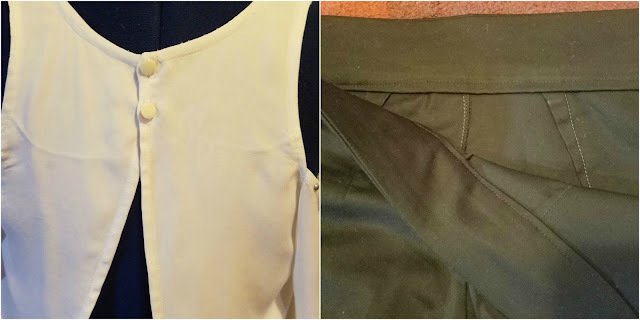 The fabric was so drapey and slippery, that I had to hold the neckline gathers into place while sewing even though I had hand-basted the seam so they didn't slip out entirely. I had to make a tiny buttonhole on the turtleneck piece that the tie threads through. There's a layer of lightweight sew-in interfacing between the layers of velvet, and the velvet layers were sandwiched between 2 layers of tissue paper. The paper keeps the velvet moving under the feed dogs and protects the fabric from the friction of the buttonhole foot. Sort of bagging a knit top lining. I chose to line the top for a clean finish and to cut down on the "show every lump and bump" factor. The technique I used is similar to bagging a jacket lining because you end up sewing everything backwards and inside out. To do this, I cut a front and back from stretch mesh 1" shorter on the hem than the velvet. Sew the shoulder seams only. Then you sew the right side of the neck's lining to the wrong side of the top's neckline towards the neck so that when you flip it, it rolls towards the body of the garment covering the neck seam entirely. After that, the right side of the lining to the wrong side of the sleeve seams on the side towards the sleeve. Don't sew completely around the sleeve. Leave the bottom of the lining's armscye unsewn the amount of your seam allowance to allow for when you sew the side seams. The lining will cover the raw seams when you turn it right side out inside the top. To finish installing the lining, bring the wrong sides of the side seams together and sew. Leave the lining hanging free or enclose it in the garment's hem as I did here. The hem stitches are hidden in the mesh. I sewed the sleeve hems with the beading needle, keeping them as invisible as was possible. A lot of the looks in the Miu Miu show used sweaters and jackets with faux fur cuffs on extra long sleeves. A lot of those cuffs were gathered up slightly with sleeve tabs. I really love the texture of those, so I decided to incorporate those elements into a wool cardigan. I'm using a blush Italian wool pointelle sweater knit I bought from Emma One Sock 3 years ago. The pattern is Burdastyle 3-2013-107. This pattern is a v-neck cardigan with front bands that are gathered along the fronts. I made this pattern a while back, and the original sweater has too much length in the front bands. Out came 1.5" in the band and I also took out 1.5" divided between 2 darts in the front that taper to zero at the armscye. I'm not sure what this alteration is, but clearly, there was fullness there that didn't need to be there. The bands and the upper chest now sit nice and flat. To add the faux fur cuffs, I cut the sleeves 3" shorter than usual. I drafted a quick cuff pattern that takes up the missing length, and I made it slighter wider than the sleeve. The extra width is needed because the faux fur doesn't stretch as much as the wool. I also made cover buttons for the front with the velvet. There's a layer of the same mesh lining I used for the velvet top in each button for opacity. I could not make buttonholes in the fronts because of the narrow bands and the loft of the knit. Instead, I opted to sew the velvet buttons as decoration and use snap tape on the inside for a closure. I hand dyed the snap tape so it wasn't so stark white. The button tabs have 2 layers of the knit and a layer of fusible interfacing. I cut them from a quick pattern piece I made up. I topstitched each tab to add the tailored look that the Miu Miu pieces have. They're sewn into the wrong side of each sleeve where the cuff and the sleeve meet. Then they fold up over the top of each sleeve to fasten with a button a little above the cuff. A lot of the Miu Miu looks employ contrasting collars. Some of them are lace, some knitted, some velvet, and all of them create another layer of texture. I made 2 removable collars I can use to add or remove texture to my look. One is from the faux fur from the cuffs. There are tiny elastic loops between the fur and the lining that hold the collar in place. The elastic fastens around 7 buttons sewn to the inside neckline of the cardigan. The second collar I made from a vintage lace collar from my Grandmother-in-law's stash. The lace had a tiny strip of netting meant for you to sew the collar into a neck seam. I sewed 2 pieces of bias tape around the netting to make a collar stand. The elastic loops are sewn between the layers of bias tape. 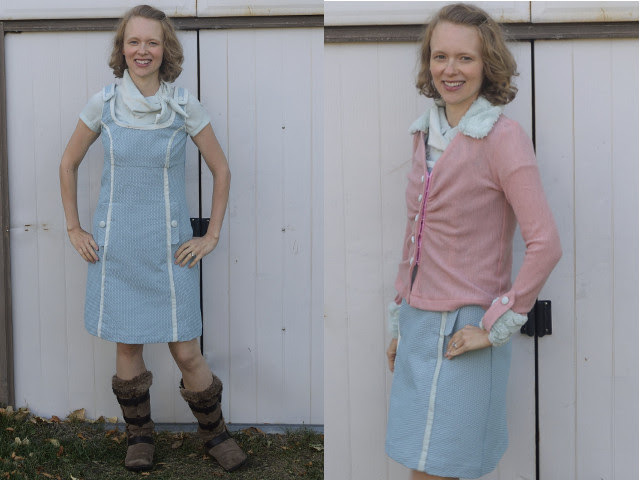 I really like that I can get multiple looks from the same sweater by adding one of the collars. The faux fur also adds a layer of warmth for cooler days, and the lace is good for warmer days. In my research for this challenge, I came across the current trend of jumper dresses. Who knew? I was pretty excited about this. I'm a Mom of 4, and my youngest is nursing. Dresses are tough for me to wear because there's so many styles that are not nursing-friendly. My solution in the past has been to wear separates. Still, I love wearing dresses. Jumper dresses allow for easy access while still allowing you to wear an actual dress. They also solve another problem for me. Being a violinist, I need freedom for my shoulders to move. I end up wearing knits 95% of the time that I'm playing and most of the time that I'm not for this reason. Woven fabrics just don't move as easily. I'm prone to injury in my upper back from this specific overuse of those muscles, so I have to be careful that I don't wear any fabrics or styles that confine my movement too much. 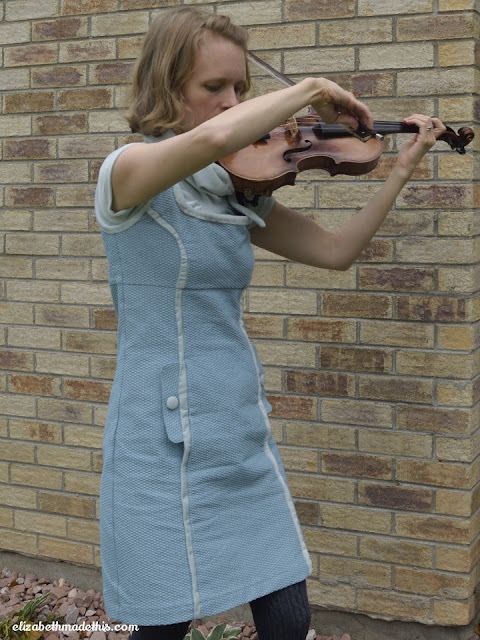 The jumper dress lets me still move around while being able to wear an actual woven fabric. For my jumper dress, I used BWOF 2-2008-112 which is a princess seam jumper with an empire bust and pocket flaps at the in-seam pockets. To incorporate the texture I was aiming for from the Miu Miu inspiration, I chose this pattern jacquard and more of the velvet from the turtleneck for the trim. 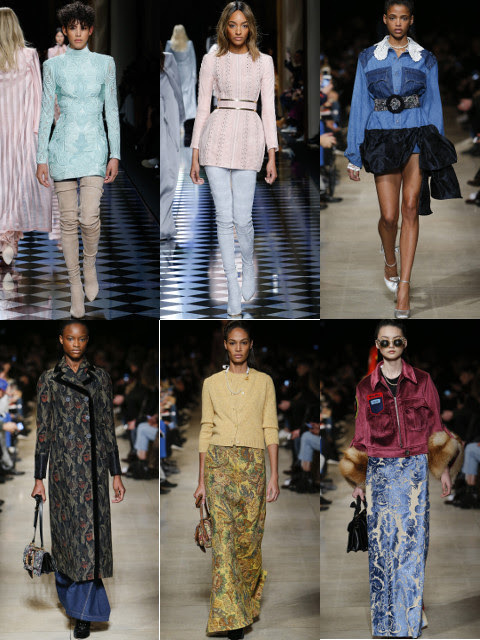 A lot of the Miu Miu pieces incorporated velvet or satin in strong vertical design lines. The princess lines gave me the opportunity to use the same kind of vertical lines in my dress with the trim. There are more velvet cover buttons on the pocket flaps and the button tabs. I cut strips of the velvet and folded each in half lengthwise. Each strip is then hand-basted for every line of trim. All of the trim was hand-basted to the jacquard. The trim on the button tabs comes to mitres in the corners. I used a beading needle to tack down the trim to the body of the dress. As I was doing this, I tried to catch just the bottom layer of the velvet. The hem is a blind hem I sewed on my machine. 1/2" dart I rotated out of the back armhole to make the armhole slightly smaller and also take out the back gaping. I took in the side seams 1" at the bottom of the armhole. This is a dart effectively that tapers back to the seamline at the bottom of the empire waist. The front straps are shortened by 1" and button tabs are shortened by 1.5"Definitely this week was a challenge, but I'm so grateful to have made it to the finals, and I'm glad I was able to complete my goals for this week! This final week of the challenge was to find my inner designer. I have only been sewing seriously for about 2 years now and I have not even begun to start making my own designs or draping on a dressform, so I knew this was going to be a challenge for me. But I prevailed. I had to select a designer that I was most inspired by and create a total look that would fit into their Fall/Winter 2016 collection. The design must fit into my lifestyle. I chose a designer named Roland Mouret. He is a french fashion designer based out of Lourdes, France. His style is clean lines, black and whites and drapey fabrics. I chose him for a few reasons; first he is not as well known (at least not to me) as the other big name designers. Also when I looked through his collection, I noticed that I could see myself wearing each and every piece that he has designed. As I stated before, I wear a lot of black and white. It's very classic and you really can never go wrong with it. For Roland's Fall/Winter 2016 collection at New York Fashion Week, he showcased quite cut out shoulder-type tops and dresses. I love this style of top and its been in my sewing queue for a while now. So I went for it. 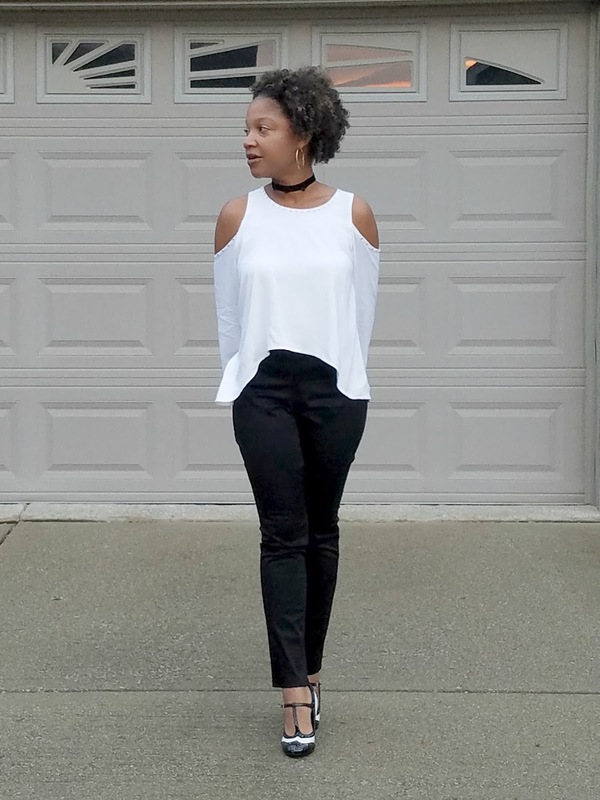 I made a cold shoulder top and matching pencil pants. I used an Indie pattern for the top. The pattern is called Chloe dress/top by Lilysageandco on etsy. The pattern is beautifully drafted with options for a cold shoulder top or dress. I obviously chose to do the top. The pants are Burda 7123. Let's talk about each piece individually. Creativity-As stated before Roland Mouret designs in a lot of black and white. 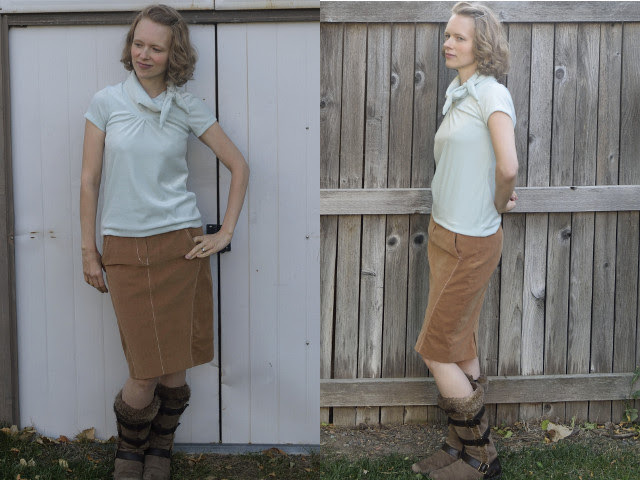 Many of his Fall designs feature a cut out shoulder, which is similar to this cold shoulder top that I made. Because I wanted to showcase the drape of this top, I chose rayon challis. I think that it flows so well in a top made like this. Cold shoulder tops are usually drapey and sometimes imitates that the top is almost falling off (which we know isn't the case). Wearability- I created a garment that definitely fit my lifestyle. I do go to social outings from time to time and I believe that this top works well when going out with girlfriends or even on a date with my husband. It is very versatile. Fit- I sewed a size small, which is perfect for me. I did not have to do any fit adjustments to this top at all. The top is meant to be flowy and free and I believe that I achieved that. Craftsmanship- The top features bias bound neckline, shoulders and back neckline. The inside seams are all serged. Because this is a "designer" challenge, I wanted to try my hand at some simple design changes. 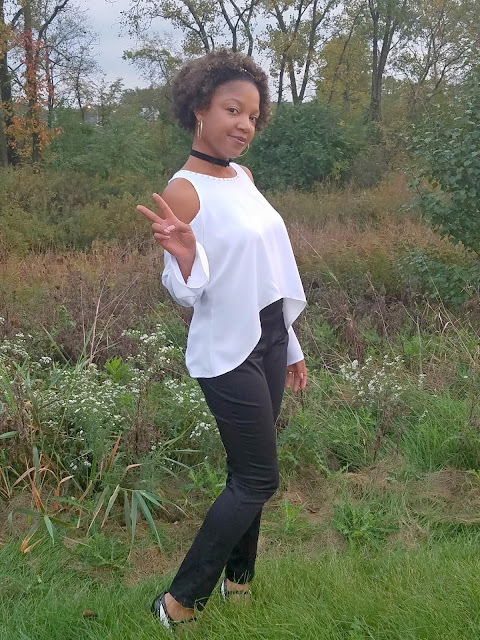 The original pattern is meant to be a straight hem, however I knew that I wanted to wear this top with high waisted pants, so I changed the hem to be asymmetrical. The other change that I made was to the back of the top. The front and back pieces are originally supposed to be cut on the fold; however, I cut the front on the fold and the back in 2 pieces. I wanted a backless look to my top so I also cut the back seam on an inverted "V". Doing this allowed the top to flow more freely and successfully achieve a backless look. 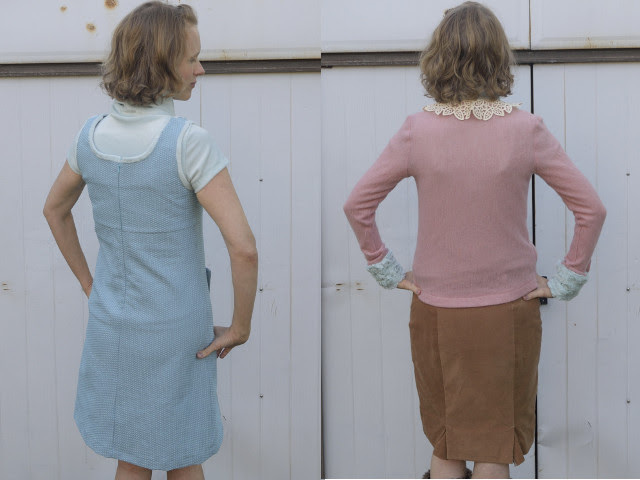 The final change to the pattern was the change in my sleeves. The original sleeve was a 3/4 length sleeve. I lengthened the sleeve and gave it more of a "bell look". Once I was done with the top, I felt that it needed more. I had some studs left over from my previous make, so I attached those for just a little bit of bling. Creativity- Looking through Roland Mouret's different collections, I noticed that he designs quite a few fitted trousers. I wanted to recreate a pair of trousers that was cohesive with my top. I felt that if I have such a flowy top, I really needed to create a pair of trousers that were more fitted, and definately high waisted and black. Wearability- Who doesn't need a great pair of trousers? 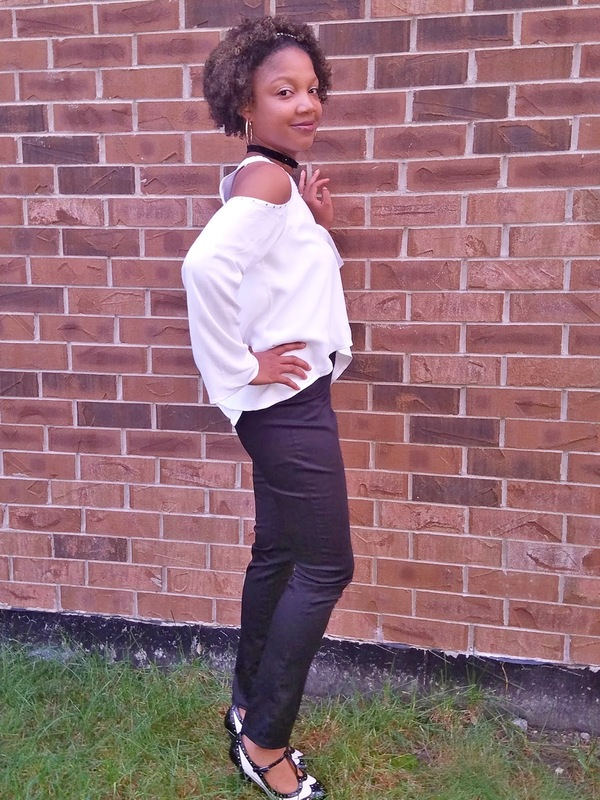 Black trousers can be paired with just about everything and you can go anywhere in them! Fit- Pants are tough! I knew that I had some challenges with pants fitting from my previous makes so I took my time with these pants. My first obstacle was choosing a fabric that was easy to work with and that kept the shape that I was looking for. I chose a cotton sateen, which turned out to be perfect because it has just the right amount of stretch. I raised the front crotch by 1/2 inch and the back crotch by 1 full inch. I also took a 1/4 wedge out of the waistband. Lastly I took about an inch out of each side seam in order to give that form fitting leg that I was looking for. Craftsmanship- The pattern called for a simple zipper, however I changed that and chose to put in an invisible zipper. I also did a simple turn a stitch hem at the bottom. No topstitching was necessary. All in all the whole design fits well with my chosen designers collection. It's wearable and it completely me. As a side note, I looked at a few other collections from the Fall 2016 shows and I noticed that choker necklaces are pretty popular this Fall. 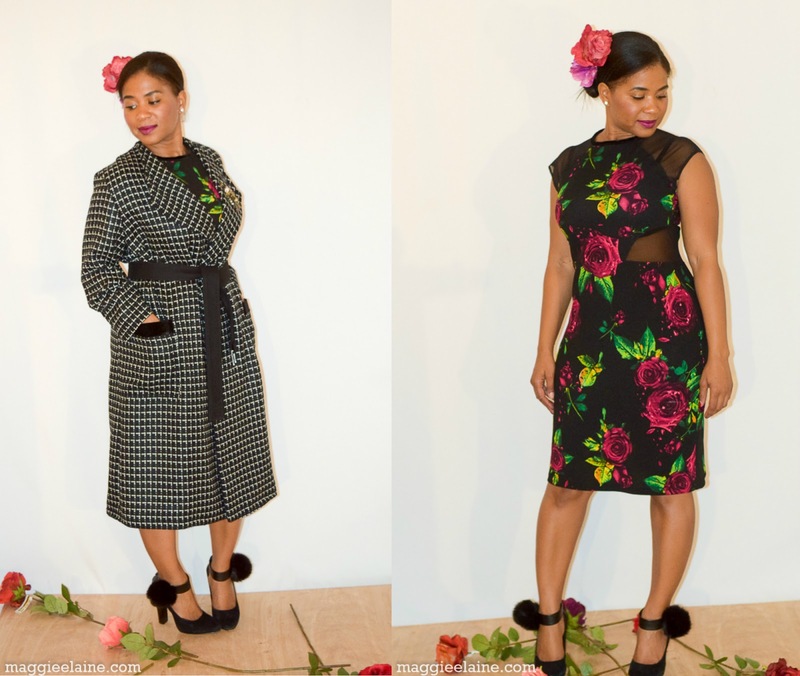 When I am sewing a garment, I am also thinking about what items I have in my wardrobe that goes well with my garment. I think about shoes, purses and accessories. I think that putting all these items together really bring out the best in your handmade wardrobe!